Aerial Roots: What Should You Do About Them? First of all, great job on rescuing your orchid from the trash! Too many orchids get tossed in the garbage because their original owners don’t know how to take care of them, when in actuality they are rather hardy plants that can bloom and rebloom year after year. It sounds like you’re watering your orchid at the appropriate frequency, so that’s an important step toward keeping it healthy. The new shoots that you see in your photo are roots, as opposed to spikes that will form buds and eventually bloom. New roots instead of a spike are certainly not cause for disappointment, though. 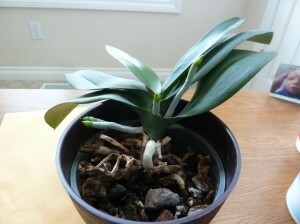 Any new root or leaf growth is a sign that your orchid is happy and is putting out more growth to support itself. In short? New roots are a good thing!